The Food & Agribusiness Network represents the Greater Sunshine Coast Region, encompassing the following sub-regions. The Greater Sunshine Coast has been a rich agricultural destination for well over a hundred years, based originally on sugar cane, pineapples and dairy but now covering everything from strawberries and ginger, to world-renowned seafood and a growing range of high quality, healthy and innovative food products. Located by the South Pacific Ocean with rich soils, a delightful sub-tropical climate and a clean water supply, the Greater Sunshine Coast is an idyllic food and agribusiness location. There is an exciting buzz in the Greater Sunshine Coast Region, where farmers, processers, retailers, exporters and chefs are all coming together to celebrate our region’s vibrant, healthy and innovative food culture. FAN is proud to provide opportunities to connect the local food and agribusiness industry, by spearheading local innovation and collaboration as Australia’s fastest growing food industry organisation. For specific information about the region’s economy, population, industry and environment/energy, please see the Australian Bureau of Statistics website. 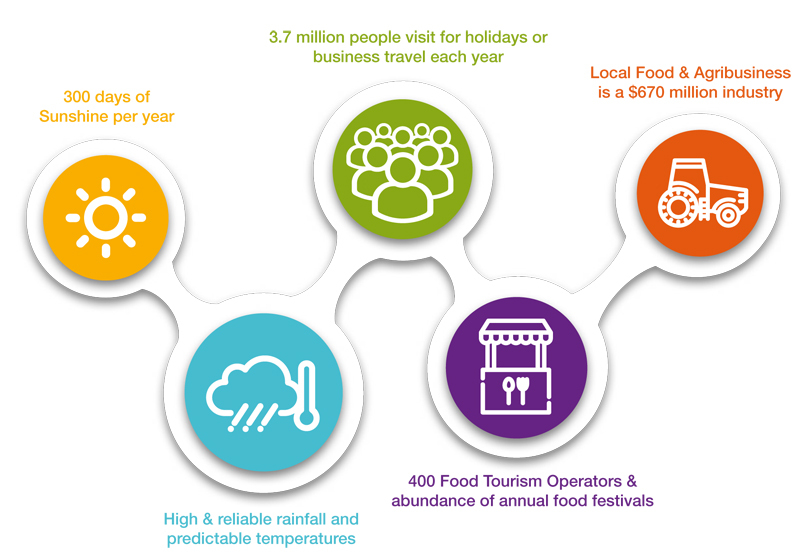 For more information on tourism in the region, see the official Visit Sunshine Coast website, which has specific information about Food & Wine and Markets & Shopping attractions in the region.